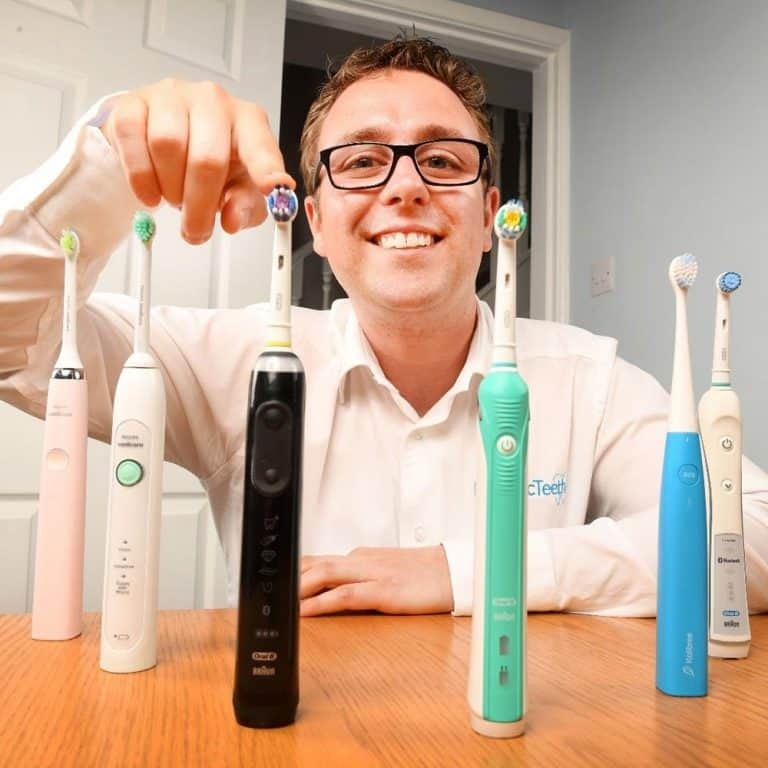 In 2017 Oral-B launched the Pro 3 3000 and the Smart 5 5000, essentially replacing the models compared below. We have ​created a comparison of these new models in our Oral-B Pro 3 3000 vs Smart 5 5000 post. The primary difference between the new and older models is the battery. The newer models have a Lithium-Ion battery which doubles the battery life. The Smart 5 does have Bluetooth too. We wish to make you aware of the different models to ensure you make the right comparison and are getting the brush best suited to you and your needs. Here is our comparison table for the newer models, and we also include the original 3000 vs 5000 comparison below. Both are capable brushes and really the decision comes down to your needs and whether you wish to pay for the extra box contents. For the vast majority, the Pro 3000 would be the better option, but by this reckoning the Pro 600 would be an even better option. The 5000 is a good option, but when spending this sort of money on a brush the Pro 6000 gets our vote. The Pro 5000 comes with an additional cleaning mode (Whitening) over and above the Daily Clean, Gum Care and Sensitive offered on the Pro 3000. The Pro 5000 (2014 & 2015 model) come with a travel case included in the box, the Pro 3000 does not. The Pro 5000 2014 models comes with a Wireless SmartGuide in the box, the Pro 3000 does not. The Pro 5000 2015 model comes with Bluetooth connectivity built into the brush, the Pro 3000 does not. The Pro 5000 comes with 3 brush heads included in the box compared to the 2 of the Pro 3000. The Pro 5000 comes with a brush head storage compartment that the Pro 3000 does not. The Pro 5000 has a darker blue frontage compared to the lighter blue of the Pro 3000. The following video includes and compares only the Pro 5000 2014 model. The following video includes and compares only the Pro 5000 2014 model with the Pro 3000. Detailed Comparison: What’s the difference between the Oral-B Pro 5000 and Pro 3000? Looking at nothing other than the brush handle and brush head attachment there is little obvious difference between these two brushes. The only way to tell the two apart is by the colour of the soft touch rubber grip that runs down the front of the brush handle. The 5000 has the slightly darker, more royal blue coloured rubber compared to the lighter shade of the Pro 3000. Both models are the same size, weight, dimension and have the same feel in hand. It is from a cleaning mode and box contents perspective that the two really differ. Starting with the cleaning mode, after all that is what we are purchasing a toothbrush for right? The Pro 3000 and 5000 both come with a Daily Clean, Gum Care and Sensitive cleaning mode, but the 5000 also offers a Whitening mode. In comparison to the other modes that last for 2 minutes in total, the Whitening mode lasts for an additional 20 seconds which is time to spend focusing normally on the front teeth, the ones we show when we smile. This Whitening mode works best when paired with the Oral-B 3D White brush head, which comes included in the box with the 5000. Such a brush head does not normally come packaged with the Pro 3000. Both brushes do include the standard CrossAction and a Sensitive brush head. When it comes to storing these, this is where another difference is apparent between these two models. The Pro 3000 has a functional but less than ideal plastic frame that offers up a prong on which each of the included brush heads sit upon. Purchase the Pro 5000 and the brush heads lay in a protective compartment complete with lid that looks and feels the more premium option. Should you need to travel with the brush, the Pro 5000 comes equipped with a travel case which will hold the brush handle and up to 2 heads. No such luxuries with the Pro 3000. We mention that the Pro 5000 is available in a couple of variants and either of these offer something that the Pro 300 does not. The 2014 model of the 5000 offers a Wireless SmartGuide whilst the 2015 model offers Bluetooth. Which is best suited or of preference to you, if at all will be your decision. Here at Electric Teeth we currently prefer the 2014 model with the Wireless Smart Guide as we feel this is more useful for the greater majority. But we cannot fault the 2015 model as the Bluetooth works well and is innovative, but many fail to see the need. The Smart Guide is an oval shaped object is much the size of a portable travel clock and comes supplied with batteries and an adhesive pad so it can be mounted on a wall if required. It acts as a clock showing the time, but when the 5000 brush is activated, the display shows a timer, a star rating, an animated face that gives feedback on your performance, a graphic to identify the cleaning mode you are on and a quadrant indicator. No matter your age or experience, we feel this is a great tool for encouragement and reminding you to continue to brush well. It is an unobtrusive motivator. Who wants a sad face? If you are not familiar with Bluetooth, it is a wireless technology that shares data between 2 computing products. In this instance,the brush and your Android or iOS smartphone or tablet. Your tablet or smartphone must have the Oral-B app installed and after a short pairing process the brush can be programmed and cleaning data transferred between the two. You see all the information you would if you had the wireless SmartGuide, but this is electronically logged within the app. This then allows you to create calendar logs of your activity and track performance and improvements. You can set specific routines and more. The benefit here is the brush will retain data of up to 20 cleans, so you do not need to have the brush paired each time you use it. If you have the app open whilst cleaning your teeth you get news, tips and more displayed on screen based on your configuration. We have mixed feelings about Bluetooth in a brush. Whilst it is very current and showing progression, for the vast majority there is no need or desire to log cleaning performance. I also felt, as much as I love technology, the app distracted me from actually cleaning my teeth properly. I felt the need to hold the phone and clean my teeth whilst reading the tips when normally, a quick glance at the SmartGuide is much easier and less distracting. As some comparison to Bluetooth, both models do also offer a feature known as ‘sound connectivity’. Similar to Bluetooth in what it offers, but less reliable. You can read more on Oral-B sound connectivity in this article. Those are the differences explained. The Pro 5000 does offer more, but at a price and is it a price you are willing to pay. In our Oral-B Pro 3000 Review we gave it a rating of 4. The same rating was given to the 2015 Pro 5000 with Blutooth (review coming soon), while the we gave 3 to Pro 5000 2014 model in our review here. In case you have yet to do more detailed research into either of these brushes, take a moment to read the following that does explain some of the similarities as opposed to the differences we have just covered. On the neck of the brush handle is a pressure sensor that will illuminate red when the brush detects too much pressure during the cleaning cycle. Simply reduce the force with which you are applying until the light goes out. You will likely hear a change in the sound of the brush motor too during this phase. Both have built in timers to assist with the 2 minute clean along with a quad pacer that alerts you to the 30 second intervals. With the 2014 Pro 5000 model, the Wireless Smart Guide would also indicate via the graphic on screen to change quadrant. When it comes to charging these brushes either the 5000 or the 3000 can be left on the charger when not in use, it is perfectly safe to do so. A simple charging stand is included and this connects to a shaver socket in a bathroom. If you do not have one, you can purchase an adapter that will allow you to connect it to a standard 3 pin mains socket in the UK. As you would expect, the two come with a standard 2 year warranty which can be extended to 3 years, if you register the brush online. Certainly worth doing. This covers faults of internal parts and not user damage. Whilst both come with a selection of brush heads in the box, 2 with the 3000 and 3 with the 5000, you can if you like use any of the additional brush heads on any of the different cleaning modes, offered by the brush. We have created a detailed comparison of all the brush heads, or the following table summaries each. Yes and no is the answer to this question. Compared to a manual toothbrush the clean will be better with more plaque removal and a greater consistency of power and brushing consistency. Over and above this the clean offered by each brush is identical as they share many of the same cleaning modes. However, it is quite possible that the Pro 5000 with the included whitening mode and 3D white brush head could offer whiter teeth by removing stains. That is not to say that the 3000 cannot, but the 5000 stands a better chance. As good as a brush is, it still requires the human hand to move it around the mouth, so to perfect the clean make sure you are cleaning your teeth properly. Yes, in most cases the Pro 3000 will retail from £34-45 compared to its recommended retail price of £89.99*. This makes the Pro 3000 work out at around about 7p per day whilst the Pro 5000 is £79*, at costs 11p per day over a 3 year period. It is possible at times to get the 5000 for much cheaper, we have seen it available for less, just be careful to pick the retailer offering the price you are happy to pay. Trying to decide between each of these is very difficult. What our personal needs are compared to yours will influence the decision. The Pro 3000 is the cheaper and perhaps better value option, but unless you are going to need or want the additional cleaning modes, why not buy the Pro 600 that is cheaper still but offers less. If the 5000 seems appealing, particularly if you want that Hollywood white smile, but we would advise also looking at the Pro 6000. There is just one variant that offers both the Smart Wireless Guide and the Bluetooth found on the differing 5000 models. It is more expensive, but often comes down to a similar price. Purchase what you are happy with based on the facts presented.